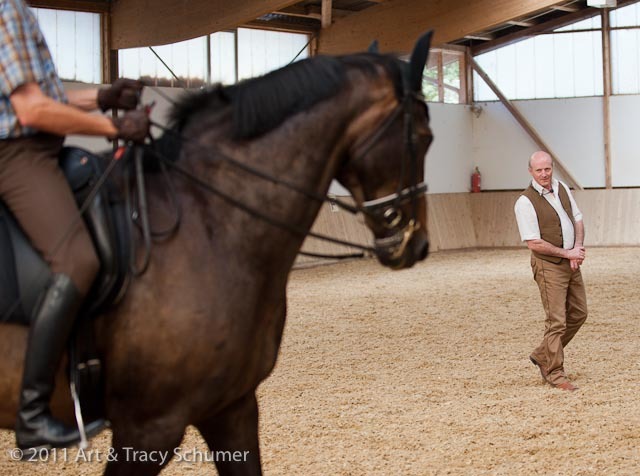 The “maestro”, is in fact famed dressage instructor Philippe Karl. He’s here conducting a clinic, checking up on his students to evaluate their progress since their class together the previous Fall. He’s watching intently as a student navigates a tall Swiss Warmblood gelding around the arena. The student is demonstrating shoulders in at the walk. His foundation is in the French tradition of classical riding. As a young man, Philippe Karl gave up medical school to work with horses full time; that was over forty years ago. By 1972, he’d risen to head of the riding section at the Centre d’ Enseignment. Later he joined the famed Ecole Nationale d’ Equitation where he focused on historic riding traditions becoming an Ecuyer at the Cadre Noir in Saumur, France, in 1985. In 1998 he ventured out on his own and in 2004, founded his now legendary l’ecole de legerete, known in English as The School of Lightness. 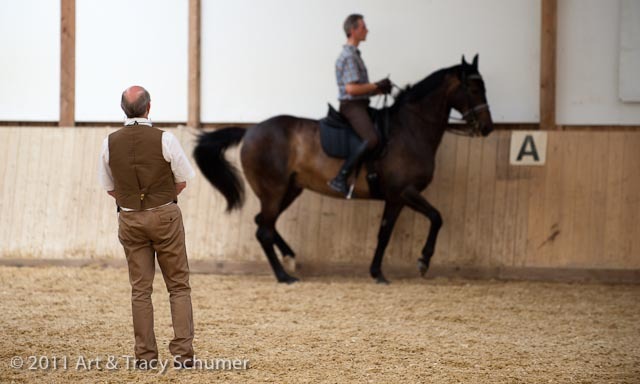 Philippe Karl has a singular goal; to change Dressage as we know it. He sees the art form moving in the wrong direction. 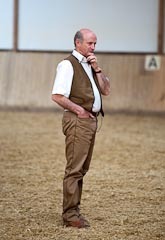 Karl is one of the most outspoken critics of modern Dressage with its emphasis on horses producing an exaggerated “look” in competition rather than horses being correct. Watching Karl work with his students and listening to his colorful way of speaking, I was struck by a remarkable resemblance Karl has to Ray Hunt and Tom Dorrance. Karl may never have heard of or met either of these men but their minds are the same. Like Hunt and Dorrance, Philippe Karl, ultimately is working for the benefit of the horse. It’s interesting to note that according to Philippe Karl, one of the purest forms of classical riding can found in the ‘California School’, also known as the tradition of the California Bridle Horse, which has it’s roots in the old world Spanish riding school. Do to their isolation, however, this classical form remained largely unadulterated as if in a time capsule. One student at a time, Philippe Karl devotes all of his attention to the rider that is in front of him. 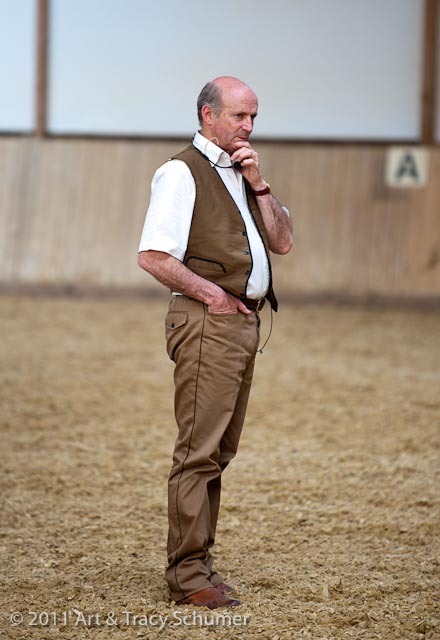 Unlike most clinicians, he does not work with groups of amateur riders he works one on one and Philippe Karl is only working with professional instructors these days; devoting his remaining years to passing on his vast knowledge to the next generation. With his dedicated following around the world, he just might pull it off, he just might change Dressage for the better.